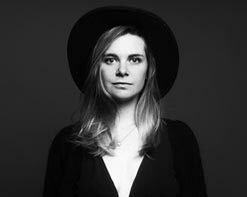 Francesca Blanchard is a young French-American singer-songwriter from Vermont whose lyrics and melodies reflect her bilingual and multicultural upbringing. Musically speaking, an eclectic assortment of styles, sounds and languages, all extremely vocally expressive and rich in musicality, have all helped shape Francesca into the artist she is today. Today, we are very excited to share with you her new video for “Rame,” a clip that is as haunting in presentation as it is beautiful in execution. Francesca’s debut full-length album, deux visions, is a collection of 12 original songs – six in French, six in English – and was recorded in the summer and fall of 2014 after a wildly successful Indiegogo campaign that allowed her to create a gem of an effort. The album was produced by Montreal producer Chris Velan (Sierra Leone’s Refugee All Stars) and features the best talent the scene there has to offer. All in all the album finds the exact balancing of peaks and valleys. When it needs to hit hard, it can felt in the pit of the stomach, and when it needs to lay low, it does so with a convincing delicacy so rarely achieved by contemporary songwriters. Filmed on a high-end RED Camera the video for “Rame” is breathtaking in its beauty. The video combines sweeping cinematic shots of Blanchard in both the role of the lead actress as well as performer. While Francesca delivers a resonating performance inside a simple home, another scene is playing out in conjunction. Dressed in a simple white dress (possibly a wedding dress?) and a blindfold over her eyes, she solemnly wanders through the soggy winter wilderness in what is likely the mountainous region near her Vermont home. As if lead by instinct, she boards a small canoe and begins to paddle. Her journey is slow, but deliberate. We can only guess if she is running away or making her way to something, or somebody. What’s most important here is that journey itself is thing of captivating beauty. All of us here at HIP Video Promo are incredibly excited to once again be working with the Cumbancha and vis-a-vis teams to bring you this spectacular artist. We would love to hook you up with a copy of deux visions, so please get in touch and let us know! Contact Andy Gesner and the HIP Video Promo crew at (732)-613-1779, email us at info@HIPVideoPromo.com for more info. You can also visit www.FrancescaBlanchard.com/.